Hi everybody! Well it’s that time of year again. The Odori beer garden is in full swing and the city is buzzing! I’ve found my way down there a couple of time this year and it is still as fun as ever. As my Japanese improves I’m finding it a lot more entertaining to talk to new people and get to know some different things about Sapporo and Hokkaido. I’m currently on summer vacation as I’m an ALT so when the kids are off school so am I. This has given me plenty of time to get out in the sun and soak up some of that good old vitamin D that I so sorely miss during the winter months. Time to stockpile. Currently making plans for some traveling in the coming months but that’s all still early days. Other then that it’s life as usual for this guy. Hope everyone is doing well and enjoying the summer! This is my first blog post here, I have been working at the café for just three weeks and I’m still new here in Sapporo. The initial wonder of daily life has not worn off yet; going to the supermarket is still an exciting trip! This weekend I did some kayaking with a friend at lake Shikotsu, and aside from the natural beauty one of my favourite parts of the trip was watching locals and tourists pedal around the lake in teacup shaped pedalo boats. 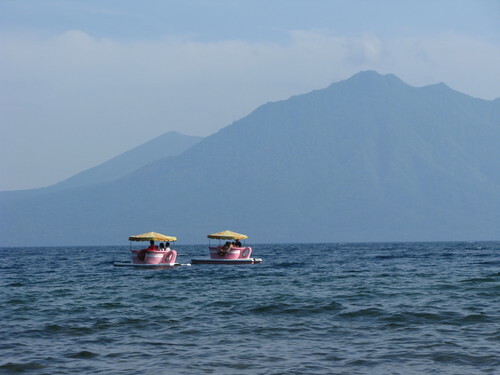 I love the culture of kawaii here, the boats looked like an extract from a Disney film, especially against the mountain backdrop. However, one reason they were so entertaining to watch was that they were quite inefficient in exploring the lake. The users had to put in a lot of effort to move short distances. Despite this, almost all of the boats were out on the lake so they were still popular. I’m looking forward to exploring more parts of Hokkaido in the coming months, next week I plan to catch the ferry from Wakkanai to do some camping on Rebun Island. It's been a while since my last post. I hope you're enjoying the summer where ever you are! As you know I'm taking a break and I'm actually posting from the Far East of Hokkaido! Anyway this time I'd like to share with you my new interest for parks and playgrounds in Japan.I don't know if it's only in Hokkaido but recently, cycling a lot around town during the day, I came to realise that there's at least a playground per block! You may not realise it but that's a lot compared to what you have abroad! Anyway, being busy at work and daytime being way to hot lately, I've started wandering at night when temperatures are cooler and streets more quiet, looking for the coolest playground in town. Have I found it or not, it’s hard to tell since there are a thousands of them in Sapporo but I can tell that I had forgotten how much fun playgrounds were! Kids are lucky! See-saws, swings, slides, merry-go-rounds, climbing nets or walls and so on. But the best structures by far are the zip-lines! There’s nothing more thrilling than hopping on a rope hanging on one side of a pole and letting yourself sliding down the other side! Of course there are many other new structures in a hundred different designs but the zip-lines, trust me, are the best! My quest for the Ultimate Playground is far from being over but if you wander at night you may find me somewhere sliding down a rope having the best time ever!